Thanks to its increasing popularity among local users, UC Browser just became the highest ranked browser app on Google Play Philippines. UC Browser is currently the No.1 third-party mobile browser with over 14% market share, according to Stat Counter, a research firm, as of the end of June 2015. 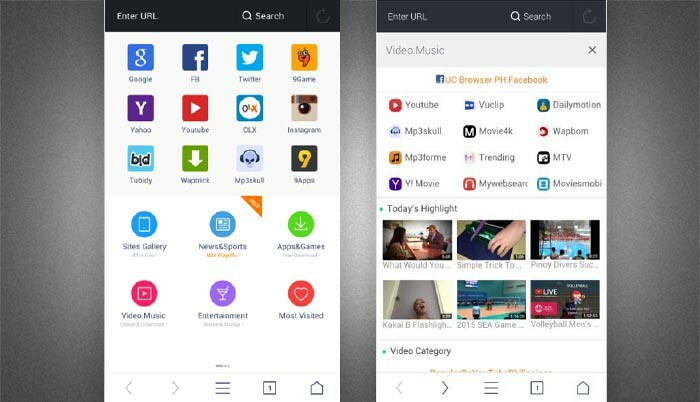 The features that enable UC Browser stand out from the crow in the Philippines are its fast browsing speed, data-saving feature, easy access to web content and powerful downloading. “The milestone means a lot for us. We attribute it to our ability to cater to local user demands. We will continue to listen closely to our users and provide them with a better browsing experience,” said, Kenny Ye, managing director of UCWeb International Business Department. The popularity of UC Browser in the country, primarily attributes to its effort in in-depth localization and technologies that speed up browsing and page loading. Firstly, the data compression and cloud acceleration of UC Browser are well adapted here in the Philippines where network infrastructure is underdeveloped. UC Browser not only saves data consumption and makes mobile internet more affordable for many people, but also significantly speeds up web page loading under various networks. For instance, Facebook is the most popular social network in the country, and UC Browser lets users do more on Facebook with faster Facebook page load time by leveraging on the dedicated servers and cloud acceleration technology. UC Browser also provides a series of content and services catered to local market’s demands. For instance, UC Browser redesigned its homepage with a rich site navigation. Smart Download is one of the most popular features, among Filipino users. Leveraging on cloud technology to turn UC Browser into a powerful downloading machine, as well as a smooth browsing tool. To achieve the fastest download speed, UC Browser utilized segmented file transfer and multi-threaded downloading technologies to split a single file into separate parts and download those parts simultaneously through multiple channels, while maximizing download efficiency based on the user’s network. Thanks to these cloud technologies, UC Browser is also able to download multiple files simultaneously in the background and get automatic reconnection when the download is disrupted. Download UC Browser from Google Play or ucweb.com to experience the top ranked mobile browser app in the Philippines. About UCWeb: UCWeb Inc. (UCWeb) is a leading provider of mobile internet software and services. Since its inception in 2004, UCWeb’s mission has been to provide better mobile internet experience to people around the world. The flagship product of UCWeb, UC Browser, is available on more than 3,000 different models of mobile devices from over 200 manufacturers, and is compatible with all mainstream operating systems. Serving users in more than 150 countries and regions around the world, UC Browser is now available in 11 languages including English, Russian, Indonesian, and Vietnamese. Additional information about UCWeb and UC Browser can be found at www.ucweb.com. UCWeb Inc. is a business within Alibaba Group.